I love experimenting with nail colours, I always think it’s such a fun way to try out new trends or colours in a subtle way. In the UK manicures and pedicures are super expensive for the most part (in Edinburgh it was around £40 in most halfway decent places just for a pedicure) so I instead always DIYed them! Now I live in San Francisco, I’ve found an awesome place that does a pretty reasonable mani/pedi/shoulder massage combo for $20 but I still enjoy doing my own nails pretty frequently too. As a general rule I tend to stick to OPI and Essie polishes as I find they last better than other brands, and I hate it when colour chips after about 5 minutes. I think OPI probably has slightly better staying power than Essie, but both are pretty decent. My old roommate had Chanel’s Rouge Noir which I think is a gorgeous colour, but I couldn’t stand how quickly it chipped! Chanel is also pretty expensive, whereas OPI and Essie are generally around the $8 – $9 mark here. 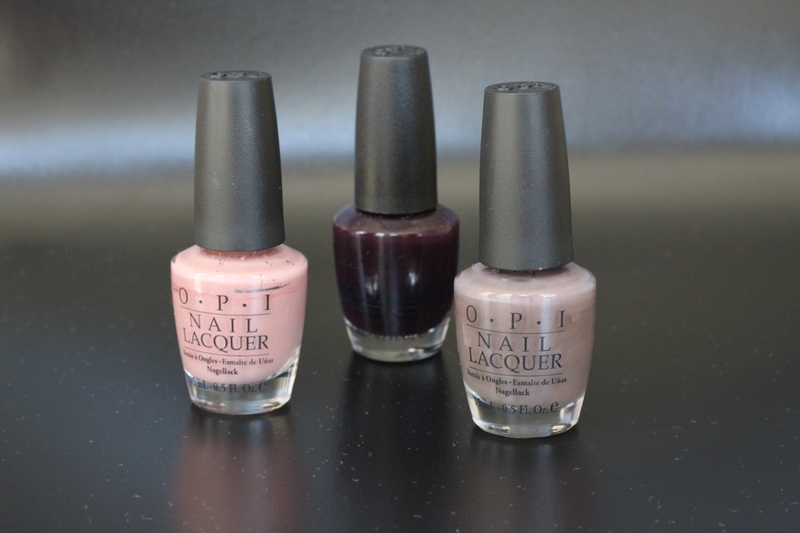 From left to right: Barefoot in Barcelona, Lincoln Park After Dark and You Don’t Know Jacques, all OPI. Barefoot in Barcelona is a pretty, warm caramel colour, that I really like on both hands and feet. Lincoln Park After Dark is a very dark auberginey/purply colour that looks fab on really short fingernails, as does You Don’t Know Jacques, a taupey/grey colour that’s surprisingly flattering. L to R: Bubble Bath and Coney Island Cotton Candy by OPI; Ballet Slippers and Mademoiselle by Essie. Everyone always raves about Mademoiselle and what a great colour it is, but to be honest, it’s probably my least favourite of the nudes I have. I really like Coney Island Cotton Candy (and it looks nice if you can be bothered to paint on white tips – I seldom can) and I read somewhere ages ago that Bubble Bath is the shade Giada de Laurentiis uses on her show. That and Ballet Slippers are clean looking pale pinks. 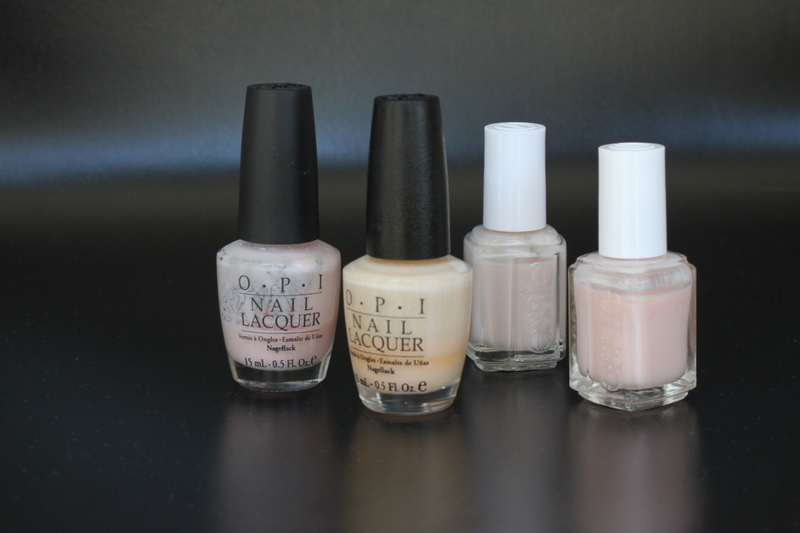 L to R: Funny Face by Essie, Malaga Wine by OPI, Steamy by MAC and Cute as a Button by Essie. The two mini Essie colours came in a set with another pair of summer pinks and are great for taking away somewhere – if I chip anything I can just touch it up! I especially like the coral shade, Cute as a Button. The red is a really nice, classic crimson and looks nice on fingers and toes, and the MAC pink was a birthday present that I’m loving. Just the right side of Barbie pink 😉 Prob wouldn’t wear that one on my hands though. And finally, base coat and top coat. The base coat is a Sally Hansen one that I’m indifferent to, think I might ditch that for some sort of strengthening formula soon. The Sèche Vite topcoat is a different story though, this stuff is awesome! It dries quickly (does what it says on the tin!) and makes your manicure look very shiny and professional. It also seems to help avoid chips too. A must buy!